With more than 2200 described species, brittle stars (Ophiuroidea) form a particularly abundant and diverse group of echinoderms. They have a relatively simple body shape, with usually five elongated arms and a central round disc. They do not have eyes nor a digestive tract, but a mouth connected to a sac-like stomach, out of which food waste is simply vomited after digestion. And yet, they are very successful animals as they colonised virtually every marine habitat, from tropical to polar latitudes, and from shallow to the deepest seas. They are really common on seamounts and muddy deep-sea plains, making this group one of the dominant components of deep-sea ecosystems. Seamounts are extinct underwater volcanoes. Ocean currents flow over the seamounts bringing a rich food supply to the animals that live around the peaks. Slow growing animals such as sponges and corals feast on tiny marine animals and bits of organic matter that float by. On Tasmanian seamounts, one particularly abundant species of coral (Solenosmilia variabilis) forms dense thickets or reefs that offer shelter to many benthic invertebrates such as sea stars, brittle stars, crabs and shells. 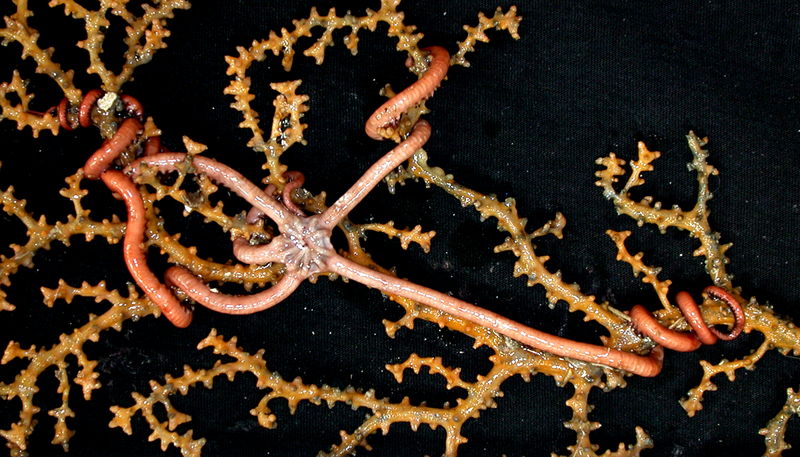 About 40 brittle star species have previously been recorded on Tasmanian seamounts. Many have not been scientifically described and we know little about how they live and reproduce. From a beam trawl on Investigator, we just collected a beautiful specimen of the brittle star Ophiocreas sibogae. It is almost always found clinging to a deep-sea coral, in this case Paramuricea sp. 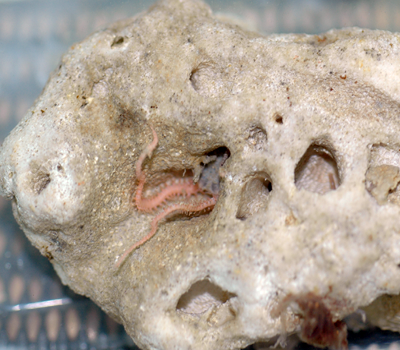 By climbing on the coral, the brittle star gets a better access to drifting particles on which it feeds. It also feeds on debris on the coral, a process that helps to keep the coral clean of silt. 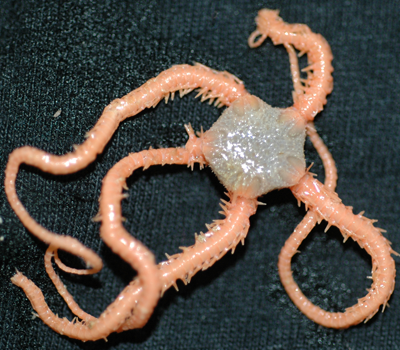 While this may at first seems like a one-sided interaction, deep-sea corals may also benefit from brittle stars, as was recently shown in the Gulf of Mexico. 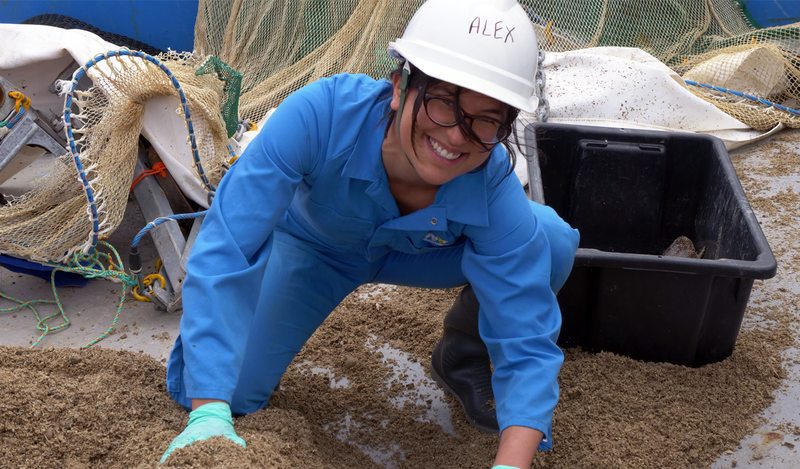 There, scientists could observe that brittle stars were most likely helping the corals to brush off the smothering “floc” of oil and dispersants after the catastrophic Deepwater Horizon oil spill of 2010. Much more remains to be discovered about the ecology and evolution of these fascinating creatures, and how they interact with other deep-sea animals. So far, my experience on the ship has been very exciting and enriching! I just needed a couple of days to adjust to the ship movement and to my new “time zone” (I am on the 2 am–2 pm shift) at the beginning of the voyage, but now I am fully enjoying it. It is the first time that I have the opportunity to examine freshly sampled deep-sea brittle stars; until now I only worked with shallow water species or deep-sea specimens from museum collections. Many species we just collected were very colorful, a feature that is lost when the specimens are preserved in ethanol. I am really looking forward to the rest of the voyage! 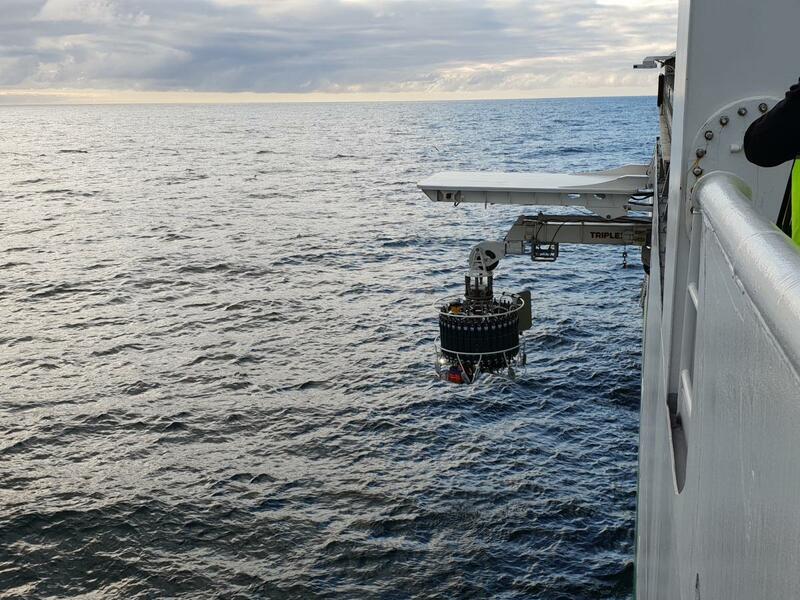 We now have one deepwater baited remote underwater video sysem (BRUV) deployed at about 900 metres depth on the top of the Sisters seamount. We released the BRUV at the surface above the seamount and expect that its 40 minute trip to the bottom was relatively direct. We won’t positively know until two day’s time when we return to ping the acoustic release, causing it to drop its anchor and rise gradually to the surface where we will pick it up. Fortunately we can delay this operation until suitable weather conditions, as winds have reached 35km/hr, and the sea is building. The second BRUV was incorrectly weighted so was retrieved for future redeployment. The deployed BRUV was baited with several kilograms of pilchards and over the next 48 hours will film alternate hours, providing periods of no light which might attract a different group of fish than those attracted when the lights are turned on. Over the 48 hours the attractiveness (smell) of the bait will decrease so we will get some idea of how the bait itself affects the species and numbers that are attracted. We are curious to see how different the fish community we see with the BRUV is from that seen with the deep-tow camera system in the same area. The unexpected meltdown of a two-week-old computer led to considerable activity among the electronics technicians as they built a new operating system for the towed camera out of available parts on board and took the opportunity to reterminate the fibre optic cable, removing a few meters of cable showing signs of wear. The ship time was used to complete some additional swath mapping which in addition to higher resolution topography provided some improved information on the strength of the return echo (backscatter) that should theoretically provide an indicator of suitable hard habitat for deepwater coral communities. An additional two water column (conductivity, temperature, depth) profiles were obtained to help describe the oceanographic conditions at each of our reference seamounts, so that we will be able to determine whether local oceanographic conditions could influence the distribution of animals, especially deep sea corals, on the different seamounts. While it is good to complete these other operations, they are also the operations that we like to keep in reserve as they can be completed when the sea conditions get too rough for deploying the cameras. When we complete them in good weather conditions, it reduces our future flexibility in planning for rougher days. With the towed camera back in operation at midday we completed four transects on a deeper seamount – Hill K1 (summit 1230 m) – observing cold water coral thickets at the top which diminished rapidly with depth, becoming patchy 100 m below the summit, and with a high proportion of dead coral matrix. Coral rubble was present below this depth. A feature of the fauna on this seamount has been a larger type of stalked crinoid, which was not so noticeable on other seamounts based on initial observations. But we will have to wait for the more detailed scoring before we can draw any firm conclusions. It was interesting to note that for this and other seamounts there are many areas of exposed rock that do not contain any large attached fauna within the depth range where we have observed live coral matrix and many other species. It appears that in the deeper depths that we have been surveying, available habitat is not a limiting feature, and nor presumably is food as some individuals survive and grow at these depths. What then limits the abundance of animals at these depths?